While violence against girls in Uganda has inflicted significant damage on their adapting, regardless of the absence of accurate information about its commonness. In overwhelming numbers, girls have portrayed the rampant use of brutality against them in their homes, in schools and in the wider community. 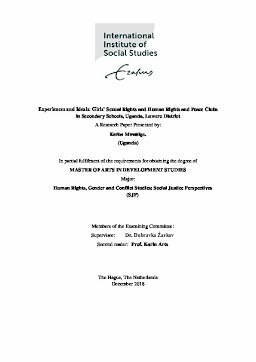 It is against this background that this study seeks to comprehend the engagement of girls in Human Rights and Peace Clubs activities by investigating their viable encounters of human rights and the manners in which they discuss their rights and their experiences vi-sa-vi the ideals. The primary spotlight on the girls in secondary school is informed by the fact that there are several human rights issues against girls in schools that include but are not limited to sexual harassment and abuse and early marriages of girl children, bullying, and un justified dismissal of female students among others. The study further employs a Human Rights Based Approach supported by the major concepts of empowerment, power, heteronormativity, “Power within” and “power with”, “Power over” and “Power to” to explore the experiences and Ideals: Girls’ Sexual Rights and Human Rights and Peace Clubs in Secondary Schools, Uganda, Luwero District.